Crown Thinning: Surprise Tree Service achieves a healthy, structure by expertly thinning out the tree crown. This pruning allows ambient light to enter the foliage, which promotes long term-health and better growth. Crown Lifting: We remove stray branches from the main trunk, enhancing visibility under the canopy, providing access for both pedestrian and vehicle traffic. Crown Reduction: By reducing the size of a tree’s canopy we make sure to leave a more beautiful and better flowering line. Dead Wood Removal: To maintain tree health, we remove broken, dead, or dying limbs from the tree crown. This helps the tree, and promotes the safety of people and property nearby. 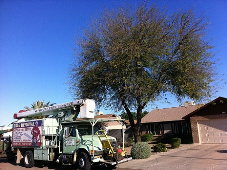 Contact us today to schedule your Free tree assessment!